The Tornado F5 table is a professional style table for tournament foosball players out there. After careful analysis of many different tables from low to high-end features and prices, the F5 foosball table ranks extremely high on our list of recommended tables. This table is loaded with quality commercial-grade parts that make it a top of the line table manufactured by the most popular manufacturer in the game today. If you can afford a table at this price point, we definitely recommend this superior table. 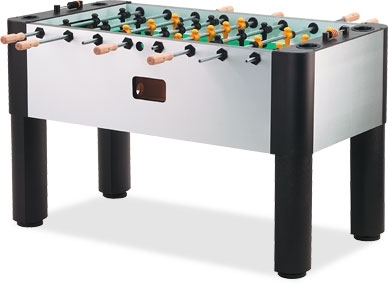 It comes equipped with all of our recommended foosball table features such as thick cabinet walls, tacky foosballs, foosball men with a ridged foot design, adjustable leg levelers, wooden handles, and a solid, level playing surface. This foosball table is priced at around $1,300 US.